Ever wondered what it would be like to live inside a volcano? Now you can have your chance at a hotel that’s shaped like one – Magic Mountain. There’s even stuff spewing off the top (water, not molten lava) and cascading down the walls and windows. But it doesn’t look much like a volcano, not to me at least. I think it’s got this old-world charm to it, like a tower from Medieval times. Especially with the antique doors and windows, and a shaky wooden drawbridge to let people into their rooms. 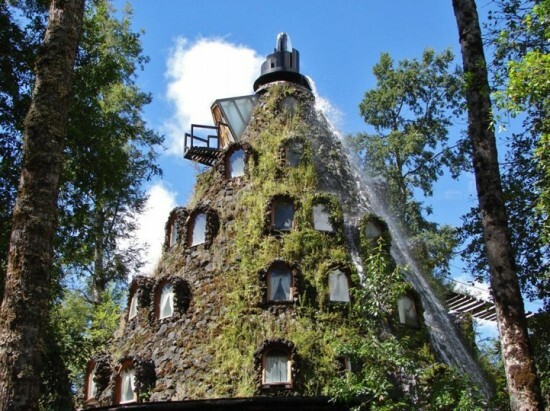 The Magic Mountain Hotel is located in Huilo Huilo, a private Natural Reserve in the Los Rios region of Chile. The antique appearance ends with the exterior however, as the interiors are done up in luxury. There are only 9 rooms, named after bird species found in the area. Each of them overlooks the thick forest and wildlife outside, including toucans, iguanas, pumas and lizards. Guests even get a glimpse of a real-life volcano from the hotel – the enormous Arenal Volcano. Outside the rooms the special services provided to guests are definitely worth a mention. Hot tubs made out of huge tree trunks, overlooking the forest are a major tourist attraction at Magic Mountain, as is the world’s longest zip line running through the grounds.